BOSTON - Saturday, October 28, 2017 - Mayor Martin J. Walsh today joined Urban Edge, elected officials and community leaders to celebrate the start of construction at the Walker Park Apartments, a $17.5 million affordable rental housing development that will create 49 new homes in Egleston Square. 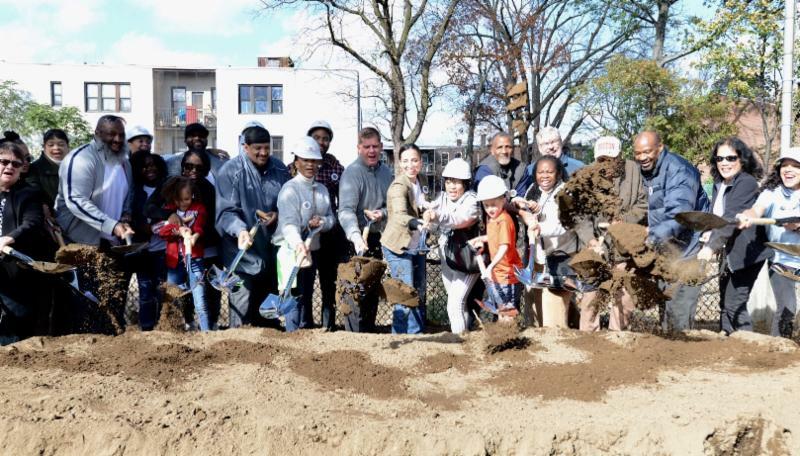 The City of Boston's Department of Neighborhood Development invested more than $2.6 million in Walker Park, which will involve the redevelopment of three sites on vacant and underutilized parcels adjacent to the Egleston Square Library and in the Egleston Square Main Street District. "Building high quality, affordable housing for working families preserves the rich character of Boston's neighborhoods," said Mayor Walsh. "I want to thank Urban Edge and our partners for their work to make these new homes possible. These are the one, two, and three-bedroom apartments working families here in Egleston Square have been calling for, and I'm proud we are continuing Boston's drive to make sure all families can live and work in the City of Boston." Walker Park Apartments are located in the Egleston Square neighborhood of Roxbury. Residents will have access to nearby parks, shopping, public transportation and the Egleston Square Library. The development is named for longtime community activist Delphine Walker, whose home once stood on one of the three sites. All of the 49 new apartments will be rented to households who earn at or below 60 percent of the area median income (AMI), including eight apartments reserved for families earning 30 percent of AMI or below. "We wish to thank Mayor Walsh, the City of Boston, Undersecretary of Housing and Community Development Chrystal Kornegay, and all of those who have made Walker Park possible," said Frank Shea, Urban Edge's CEO. "As Boston continues to grow, we know it is important to find ways to create quality affordable housing for families and individuals in need." When complete, Walker Park Apartments will include 13 one-bedroom, 28 two-bedroom and eight three-bedroom family apartments, an elevator for accessibility, on-site laundry facilities, on-site parking, and a pocket park along Columbus Ave.
"My family is so grateful to Urban Edge and to everyone for creating Walker Park," said Pam Walker, daughter of Delphine Walker and a resident of Egleston Square. "My mother spent many years working on behalf of the Egleston Square community, and this project is an extension of her work. We couldn't be happier to see her honored this way and to see the site of our family home provide opportunities for other families." Walker Park Apartments is a City of Boston Lean Pilot Project, which has a goal of reducing the cost of delivering quality affordable housing by applying a new approach to design, and was supported by Massachusetts Housing Partnership and Enterprise Community Partners. As part of this pilot, Urban Edge, the architect, the construction manager, and the City were involved from the beginning of the design process, ensuring that all choices were the result of multifaceted decision-making that considers cost among other project and community goals. This process resulted in significant construction cost savings. Additionally, almost 50 percent of the subcontractors committed to working on the project are minority-owned businesses and more than 22 percent of the committed subcontractors are women-owned. In accordance with the City of Boston's Green Affordable HousingProgram, Walker Park Apartments will utilize a high efficiency heating system as well as Energy Star rated appliances. The development will employ environmentally friendly design features throughout and will meet the U.S. Green Building Council LEED Homes Silver certifiable standard. The development will also meet the U.S. Environmental Protection Agency's Energy Star standards. The development team is made up of Urban Edge, Prellwitz Chilinski Associates as the architect; and NEI General Contracting, Inc. as the general contractor. Walker Park Apartments has been made possible in part by more than $2.67 million in funding from the City of Boston, as well as $3.46 million in State and Federal Low Income Housing Tax Credits from the Commonwealth's Department of Housing and Community Development (DHCD). Financing team members also include Bank of America Merrill Lynch, Brookline Bank, the Community Economic Development Assistance Corporation, MassDevelopment, MassHousing, Massachusetts Housing Investment Corporation, Massachusetts Housing Partnership, US Bank Corporation, and the US Department of Housing and Urban Development. Today's groundbreaking builds on the goals of Housing a Changing City: Boston 2030, the Walsh administration's plan to stabilize the housing market, accommodate growth, improve housing accessibility and increase affordability. Since 2014, the implementation of the City's housing plan, 13,551 new units of housing have been completed. With an additional 8,412 units currently under construction, the City has secured housing for an estimated 25,000 residents, making significant progress in meeting Boston's rapid population growth. These efforts are part of Imagine Boston 2030, the city's first citywide plan in 50 years which aims to proactively encourage a broad range of housing growth for people of all income levels and stages of life. For more information on Imagine Boston 2030, please visit imagine.boston.gov.